Around the country, even left-leaning local governments are struggling to find the best way to help immigrants. Hillsboro, Oregon, is a long way from Maricopa County, Arizona, or McAllen, Texas, or any of the most infamous frontlines of America’s increasingly fiery immigration debate. A happily humdrum suburb a half-hour drive west of Portland with a population just over 100,000, it’s a liberal city in a liberal state. 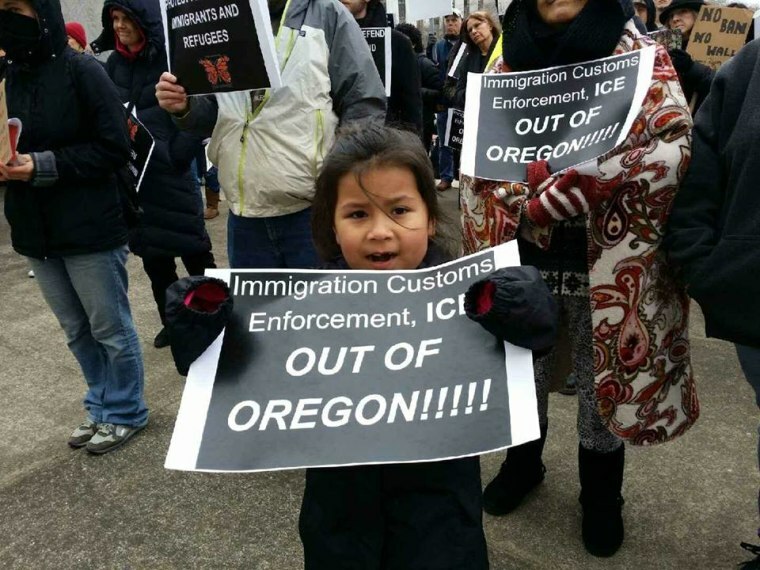 But since Trump’s shock election victory, the immigration debate has swept through Hillsboro just the same, stoking anger, fear, and recrimination. The focus of the tension: Resolution 2552. Brought forth in December, it asked the city council to declare Hillsboro a sanctuary city. Effectively, a “sanctuary city” is any city that has pledged not to cooperate with federal agents engaged in deportation. Those sanctuary cities (and sanctuary counties and sanctuary towns and sanctuary villages) do not force their police officers to inquire about immigrations status, and they do not aid in deportations. Since Resolution 2552 was first broached, the community responded with a public march of support and rambunctious approval at public city council meetings. It’s not surprising that Trump’s immigration policies were unpopular here: Oregon hasn’t voted for a Republican in a Presidential election since 1984; in 2016 Hillary Clinton beat Trump in Hillsboro’s Washington County by 26 points. Over a quarter of Hillsboro is Latino, and the community’s presence is evident: there’s a carniceria down the street from a mini mart, a Super Tacos Ochoa just around the corner from the Spaghetti Western Wine-and-Dine. The final vote on Resolution 2552 was scheduled for March 7. Leading in, the question around town was not whether the proudly multicultural Hillsboro embraced or valued its immigrants. The question was how much Hillsboro was willing to risk for that community. How far would the city go to protect its undocumented residents from the federal government? For cities declaring sanctuary status, Trump has vowed vengeance by stripping federal funding; there’s also the concern that the more boldly a city declares itself a safe zone for immigrants, the more likely ICE is to come rolling in. By loudly declaring sanctuary city status, Hillsboro feared it might be putting itself in the crosshairs of the Trump administration. Hoping to buck up his shaken community, Pastor Vazquez began consolidating support for sanctuary city status among the faith community. Through a weekly men-of-the-cloth coffee hangout, he locked in agreements from fellow pastors at largely white Episcopalian, Lutheran, and Protestant congregations to push the city council on the issue. Then the churches went to the local immigrants-rights organization Voz Hispana. On February 7, the network mobilized and created a rare sight for Hillsboro: a public march and rally in support of Resolution 2552. Most places that don't cooperate with ICE are not as bold. Many are arguably as motivated by a certain sense of justice as they are by a desire to save money (eliminating, say, the cost of temporarily detaining an undocumented person for ICE.) Many would rather not be found on lists or cheered online. For Hillsboro, declaring sanctuary city status is, in large part, be a technicality. Along with just four other states — California, Vermont, Rhode Island, and Connecticut — Oregon already effectively operates as a “sanctuary state.” The state’s law enforcement agencies do not use staff or resources to “detect” or arrest anyone whose only violation is being undocumented. Hillsboro, taking its cue from the state, has long followed those same practices. In Hillsboro, though, the question of sanctuary since Trump’s election was as much emotional as it was pragmatic. At the city council’s February 21 meeting, Hillsboro Mayor Steve Callaway attempted to plug an upcoming production from a local theater. “We have a presentation entitled My Inlaws Are Outlaws,” Callaway, a former principal who holds the mayorship as a part-time post-retirement gig, chipperly announced. But the attempt at normalcy was bizarrely out of place, and quickly shouted down: “We want public comment!” multiple voices cried. The speakers at the city council meeting did not use the same religious terminology as Pastor Adam. But their throughline was more or less the same: There is right and there is wrong. And we can not just hope to duck the Trump administration for four (or eight) years. It would put us on the wrong side of history. Over morning coffee Francisco Lopez, of Voz Hispana, grounded the movement back in the practical. He believed the nationwide sanctuary movement must begin to go “beyond the political statements, beyond non-cooperation,” and into actionable, palpable measures. He name-checked health and community services for immigrants and Portland’s recent consideration of a $50,000 grant to help undocumented people fight deportation. As of now, ICE has continued the Obama administration policy, creating situations in Phoenix and Denver where churches are actively housing and sheltering undocumented people. But there’s no telling how long that will be an effective strategy. “If you’re a city, you look out for the wellbeing of all of the residents, regardless of immigration status, the color of their skin, their language,” Lopez said. His implication: It’s all well and good that Hillsboro expresses appreciation of its immigrants (as they did in December with a “joint statement in support of diversity”). Hillsboro effectively acts as a sanctuary city, yes. But if Hillsboro can’t bring itself to call itself that, will it ever take an extra step beyond? Should its undocumented residents ever expect real, tangible support? Lopez is originally from El Salvador: he left in the mid ’80s, at the height of the Salvadoran Civil War, and entered the country illegally, through Texas. (A few years before, while attending the mass funeral of the hugely beloved Archbishop Oscar Romero, he saw his 19-year-old cousin killed by what he believes were military snipers firing with impunity at the crowds below). On February 21, the Hillsboro city council met for a “work session — a meeting open to the public, but not, like the general city council meetings, open for debate. They listened to a presentation from a panel of three Hillsboro officials on the possible impacts of the sanctuary city resolution. True to Hillsboro’s liberal reputation, the city council did not once express actual support for Trump’s mass deportation efforts. Again and again, the conversation circled around to one central idea: would declaring sanctuary city status help or hurt the city of Hillsboro and its immigrants? On March 7, the much-anticipated vote was held. It was a clean split. Three council members, including Nachtigal, voted against. Three others, including Alcaire, voted in support. The onus then turned to Mayor Callaway. He’d been cagey in expressing his opinion publicly, perhaps hoping to best keep tempers down throughout his jurisdiction. But when the decision was left for him to make, he, of My Inlaws Are Outlaws interest, expressed a higher purpose. “For me,” he said, “this is a vote to say to the children who have grown up here, who have done the right thing and have gone to school, that there are no spare parts in Hillsboro.” The Mayor voted aye; Resolution 2552 passed. And the Shirley Huffman Auditorium, watched over quietly throughout the night by 30 or so local cops, broke into cries and applause. Hillsboro didn’t stand to lose as much money, and maybe that made the decision easier. But it could have ducked as well — it had plenty of opportunities to do so. Instead, it chose to send that wide statement of support. This is no all-purpose panacea. That Portsmouth assistant mayor, and councilman Nachtigal, and Francisco Lopez are all right: without additional, substantive efforts from local governments to stop deportations — like, perhaps, the aforementioned legal fund for lawyers for would-be deportees — the federal government can kick many people as it wants out of the country. Like Nachtigal said: If the Feds want to come in, they can. Attitudinally, though, the sanctuary city movement — and its place as a rebuttal to Trump’s vision of America — may already be having an impact.